●図子 浩二 （2015） 「体罰・暴力根絶のためのコーチング学からのアプローチ法」『体育学研究』60 （Report）: R10_1-R10_14. 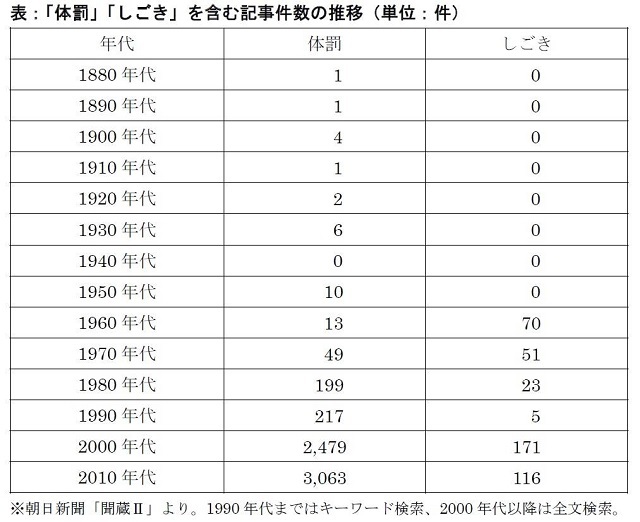 ●谷釜了正他（2016）「日本体育大学における体罰排除教育の効果 : 卒業年次生の分析」『日本体育大学紀要』46, 1: 91-104. ●Yerkes, R.M., & Dodson, J.D. （1908）. The Relation of Strength of Stimulus to Rapidity of Habit Formation. Journal of Comparative Neurology & Psychology, 18, 459-482. ●Hardy, L. & Fazey, J. （1987）. The Inverted-U Hypothesis: A Catastrophe For Sport Psychology? Paper Presented at the Annual Conference of the North American Society For the Psychology of Sport and Physical Activity. Vancouver. June. ●Hardy, L. & Parfitt, G. （1991）. A Catastrophe Model of Anxiety and Performance. British Journal of Psychology, 82, 163-178. ●Jeffrey A.Miles and Jerald Greenberg （1993）. “Using Punishment Threats to Attenuate Social Loafing Effects among Swimmers.” Organizational Behavior and Human Decision Processes 56, 2: 246-265. ●Yoshifumi Tanaka and Hiroshi Sekiya （2011）. “The influence of monetary reward and punishment on psychological, physiological, behavioral and performance aspects of a golf putting task.” Human Movement Science 30: 1115-1128.